Start rounding decimals with Zapzapmath! There have been mysterious power outages all around the Zapzapmath ecosystem, and they have caused multiple concerns to be sent to the mayor. The mayor has contacted you to help determine what is causing these outages, and how to prevent it from happening again. You study the map to distinguish what the source of all the outages is. It seems all the affected areas are surrounding one specific location: Frankenstein’s castle! Cryptic secrets shroud Doctor Frankenstein's castle with a looming sense of fear, but the mayor and ecosystem is counting on you, so you take a deep breath, count to four, and slowly knock on the door. Footsteps boom and the door creaks open, and standing there is Doctor Frankenstein, happy as a clam can be. He welcomes you in with the friendliest of smiles, and tells you about a grand plan to make a wife for himself. He has created a mathling to call his own, and he wants to bring her to life through the power of electricity. Though the plan is great, Doctor Frankenstein cannot seem to get the right calculations of electrical surges to bring his wife to life. Every single time he gets the estimates wrong, it causes a massive power failure. Now that you have an explanation for all the outages, it is time to find a solution to not only restore electricity back to Zapzapmath, but also to help Doctor Frankenstein make for himself a happy wife! To do so, you need to start rounding decimals up to the closest hundredths or thousandths by sliding the control bar towards the correct answer. The correct answer will create a surge of electricity and charge the two Leyden jar capacitors, bringing Franken Wife to life. Rounding decimals wrongly will cause yet another power failure, and Franken Wife will remain lifeless. So do your best and start rounding decimals up; the fate of Doctor Frankenstein’s chance at romance remains in your hands! 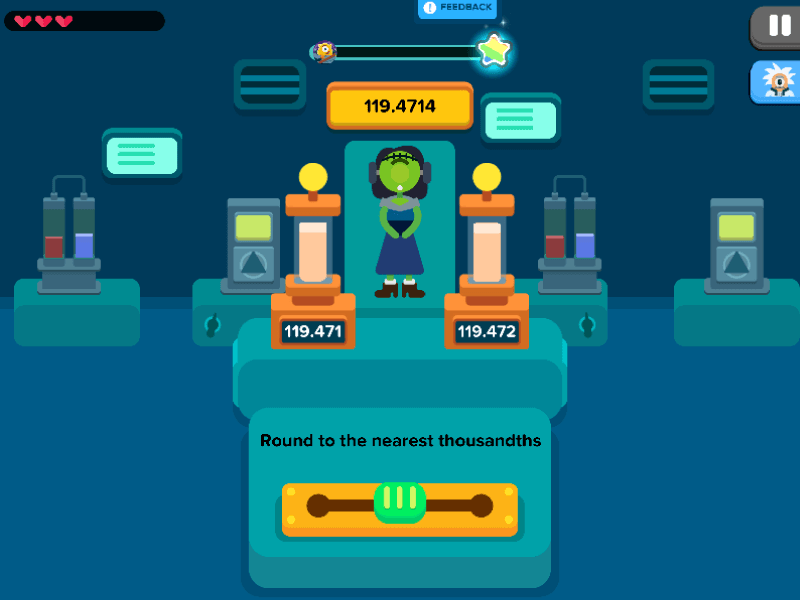 Franken Wife is a game that teaches you to get into the habit of rounding decimals. We can round decimals to a certain number of decimal places to create a kind of estimation where exact values are not too significant. The practice of rounding decimals is used to make a number easier, but keeping its value close to what it is. To start, first find the place value or rounding digit that you want, and look at the number on the right of it. If that number on the right is less than 5, you leave the rounding digit as it is and drop all digits behind it. If that number is greater than or equals 5, you add 1 to your rounding digit and drop all digits behind it. Now that you know how to round off decimals, it is time to bring romance to life! Round hope up into one great estimate!